On our recent trip to Europe, I expected excellent beer during our 3 days in Belgium, but the most pleasant surprise to me was what a wonderful beer town Amsterdam is. 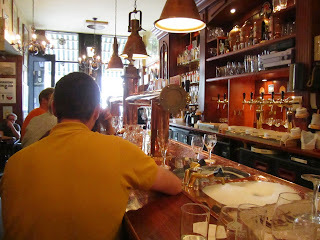 I already wrote about Gollem's Proeflokaal, but my favorite pub of the whole trip was 't Arendsnest, a beer bar in the western canal district of Amsterdam that only serves beer brewed in the Netherlands. It's not just the selection of 30 Dutch taps and scores of bottles that makes it a great place, but the cozy, comfortable digs and the relaxed atmosphere. On our first visit, Carla and I had very little idea what to order. 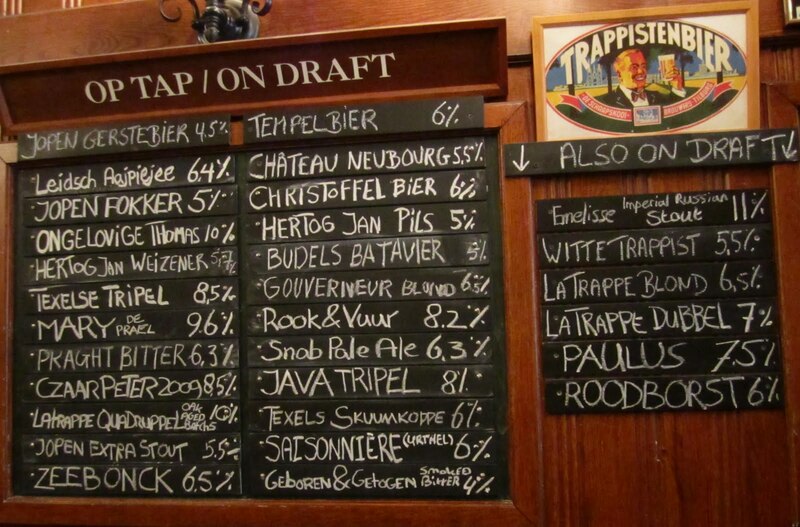 The only familiar names to me on the taplist were La Trappe, which I figured is readily enough available in Portland, and Jan Hertog, which I had seen alongside Grolsch at the supermarket in the Jordaan neighborhood where we were staying. Luckily in scanning the taphandles I noticed that the "Rook & Vuur" on the chalkboard was actually a smoked doppelbock ("Smoke & Fire") from De Molen -- possibly also available in Portland, but never on tap, and pretty pricey in the bottle. Now we had to figure out something for Carla -- treading around the abbey-style ales that she doesn't usually like -- but a quick consultation with the bartender led to an excellent choice: Jopen Extra Stout. The Rook & Vuur had just the right touch of smoke on top of a deep, complex beer. The Jopen was a delicious, dark, roasty, creamy stout that arrived with a thick, tan head that stood up over the top of Carla's goblet. In the picture at the top you can see a sink of soap suds and a sink full of clean water. When you order a draft beer, the glass is washed and rinsed before being filled, then carefully submerged first in the soapy basin and then in the clean basin before being handed to you, to keep you from having any sticky beer on the outside of your glass. Is this outside rinse after the pour the usual Low Country ritual? Maybe we tended to order bottles more often at other places, but 't Arendsnest is the only place I noticed the rinsing ritual. More good beers were had on a second visit. 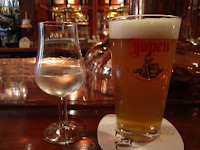 I pressed the light and hoppy Jopen Gerstebier into service as the beer side of a kopstootje, somewhat to the amusement of the Arendsnest bartenders, but I was a little disappointed that the shot of genever wasn't served in the tiny glass that gets filled up past the rim. Carla continued her imperial stout mission with an Emelisse on tap. I wasn't all that happy with my next beer, a low-gravity De Molen rauchbier called Geboren & Getogen ("born and raised"). I was hoping for something like Rook & Vuur's little brother, but they seemed to be totally unrelated; Geboren had some "band-aid" phenols that I didn't care for, and a tiny bit of sourness that didn't go well with the smoke for me. I consoled myself for that beer disappointment with a taste of barrel-aged 3-year-old genever from Zuidam; as luck would have it the bar didn't have enough for a full shot, so I was compensated with a half shot of 5-year-old genever from the same distiller. It was more along the lines of a whisky than a gin, but still pretty dry and with nice aromatics. The 5 was much smoother than the 3, and that's what I'd get if I were having it again. (By the way, It's Pub Night sponsor Master of Malt sells Zuidam 5 Jaar Zeer Oude Genever, including small samples.) The evening was capped off with the Java Tripel from Holland's De Halve Maan brewery (not the one in Brugge). Don't worry, it wasn't a coffee tripel, just a straightforward, decent abbey-style ale. A little bit of snack food is available at 't Arendsnest, cheese or sausage trays and a few variations on the peanut -- I liked the crunchy corn-battered borrelnoten. The pub is not terribly large, so I imagine it might get a little crowded, though we easily found spots at the bar on both of our visits. 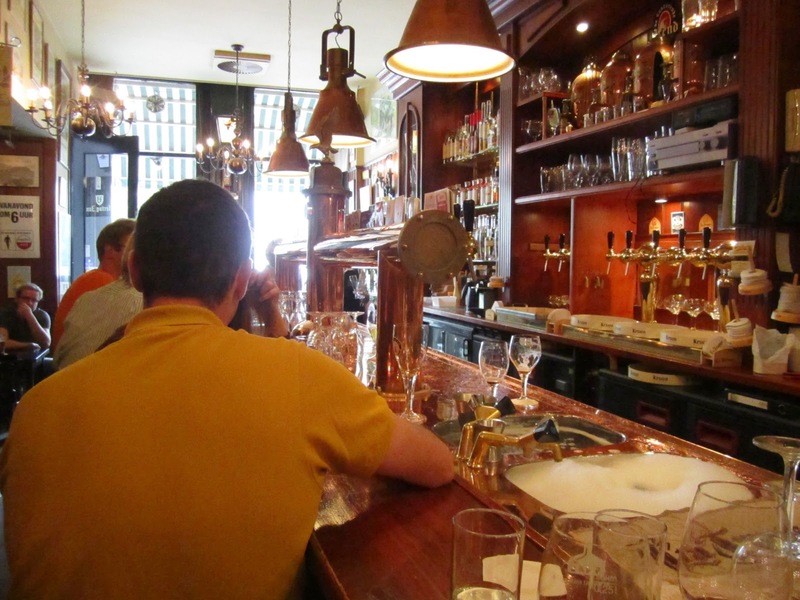 If you have a large group and you want an introductory lesson on Dutch beer, 't Arendsnest takes reservations for guided tasting sessions that are held in a separate area in the basement, though you'll miss the ambiance and camaraderie of the ground floor. 'T Arendsnest is a knockout. Don't miss it if you're in Amsterdam. Nothing pleases me more than hearing about local beer culture--unless it's getting grammatical information about foreign languages. A home run post! Thanks, Jeff! It took me hours and hours to write that post. I figured the effort way exceeded any joy that would come from it, but I'm glad it struck home with you. I can tell you put a lot of work into it. All I can say is: thanks! Session Beers? Or Smaller Pours?